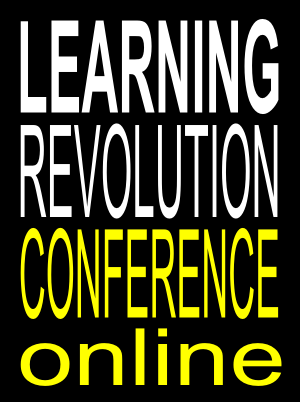 The first-ever Learning Revolution Conference kicks off this coming Monday, April 20th, online and free, with a terrific set of keynote and distinguished speakers and a full day of conference sessions on Thursday, April 24th. The schedule is below. Forward to your friends and colleagues – this event is free! The LearningRevolution.com project has over 200 partner organizations and bridges schools, libraries, museums, and the work, adult, online, non-traditional and home learning worlds. The theme for this conference is “What Are We Learning About Learning?” As the Internet shifts the boundaries of when, where, and how we learn, we believe our learning worlds will increasingly overlap. All sessions are recorded and the recordings are generally available within an hour of a session’s completion. Keynote recordings will be uploaded to the Learning Revolution YouTube channel. Mobile users will be able to connect to sessions by going to LearningRevolution.com on your mobile device. Live chat and help during the conference will be at theconferencelounge.me. To see the schedule in Hawaii time zone, with session descriptions and links to attend, please go to http://learningrevolution.com/page/attending-schedule.